Never worked with a graphic designer before? Have you worked with a designer for years, but want to know how to make the process more efficient? Contacting a designer shouldn’t be stressful, it should be an opportunity to collaborate and solve a problem. 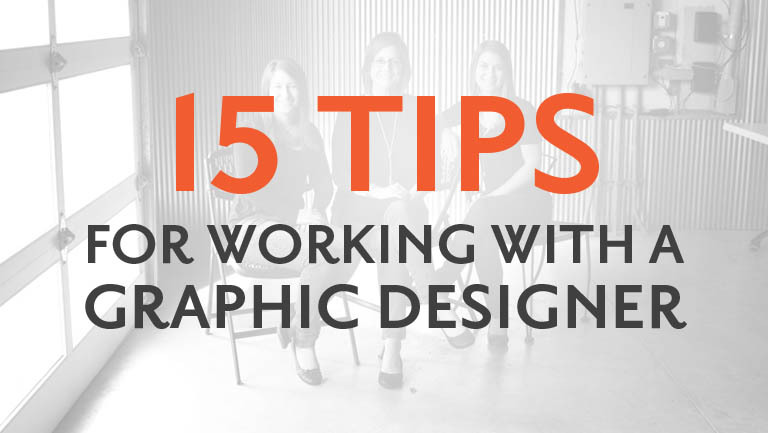 Here are 15 tips for working with a designer to get the highest quality outcome for your project. 1. Does your project have a clear objective? What goal do you hope to accomplish? For instance, if your business needs materials to promote an event, your goal is to reach your target audience and get them to attend the event. 2. Who is your target audience? Gather demographic and behavioral information about your audience that you can share with your designer. 3. Is content completed or in progress? This includes all written content and imagery. If you are holding an event do you know all the details? If you need a logo have you finalized the name? If you are publishing a magazine have the articles been written? 4. What is your timeline for the project? It is helpful to work backward from the projected project completion date and put deadlines in place for receipt of content and proofs. 5. What is your budget? Get an idea for how much your organization has budgeted for the project. This may also affect the quantity and type of deliverables you are able to get. 6. What are the deliverables? Deliverables are the take-away pieces from a project. They could be anything from a business card, to a billboard, to a branded water bottle, or a website. 7. Who needs to approve the design? Some organizations require design approval by their board, especially if it is a branding project. Some companies need the approval of company leaders, which often occurs toward the end of the process when the project is near completion. Other companies have project committees where people from different departments work together. 1. How does the proofing process work? Discuss with the designer how proofs will be received. Most proofing is done via email. The client gets a chance to look over the design and give feedback. Some designers put parameters on the number of revisions allowed before additional charges are incurred. 2. How much is the project going to cost? Designers have different structures for charging, some charge an hourly rate, and some charge a project fee. If a designer only tells you their hourly rate ask them to give you an idea of the amount of time a comparable project has taken. Also, ask if there are additional charges for revisions. If you are worried about a project going over budget based on a change in the project scope talk to your designer about how those changes affect the cost. 3. When is payment due? Have a conversation about when payment is due. Some designers require a deposit before they begin work, others invoice in full upon project completion. 4. Does my project fit into your work schedule? Set realistic timelines with each other. Designers should have an idea of upcoming projects and be able to give you an estimate of how long it will take to get a first proof completed. 1. Give feedback early in the process. If you aren’t loving the direction of the project don’t wait to tell your designer. 2. Be timely in your correspondence. The sooner you get back to your designer the sooner they will be able to get back to your project and make revisions. 3. The easier you are to work with, the faster your project will move up the priority list. Being organized, responsive, and kind creates a great environment for collaboration. 4. When you give feedback avoid saying “I don’t like…” Instead, explain what it is you aren’t responding to, whether it be the font, color, image choice or concept. As much as they’d love the superpower, designers aren’t mind readers. 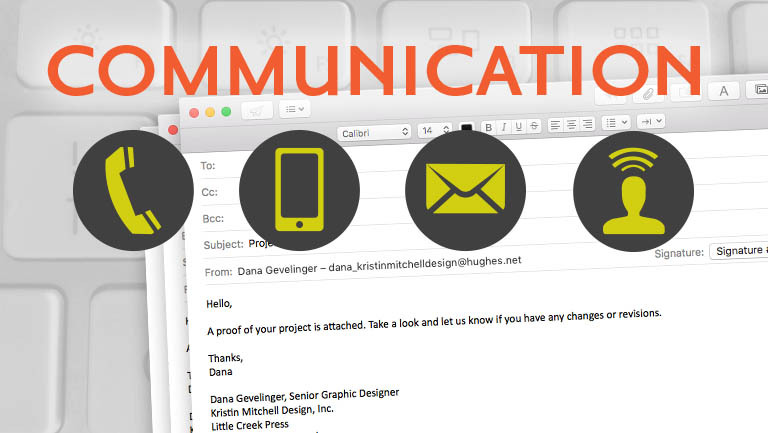 Use these tips to develop a great working relationship with your graphic designer. Contact us if you have more questions or follow us on Facebook to see what we’re up to. If you liked this blog check out Don’t Settle for Design You Don’t Love.